No contractor credit issues on this set since I was director,DP, sound guy AND editor. 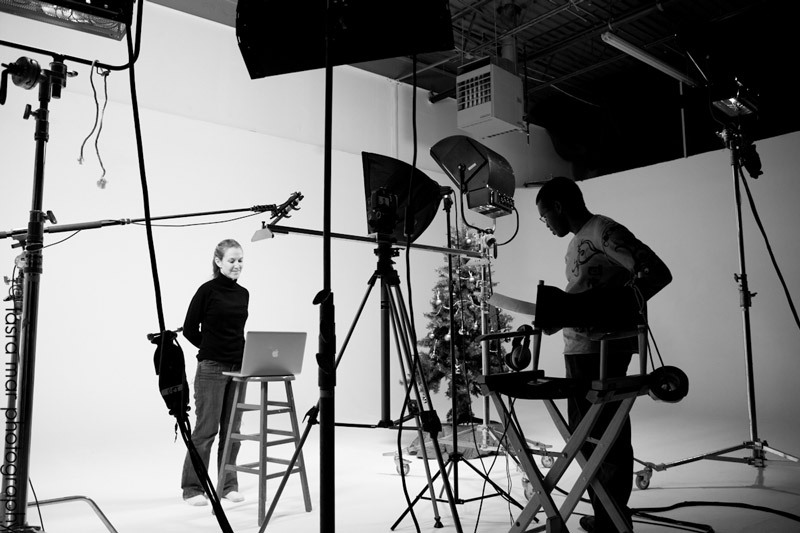 If you’re a growing video or photography business, at some point you will most likely have to hire subcontractors. These could be second shooters, sole shooters, or editors. When that happens, you will face a very important decision: how do you handle the work those contractors produce? Whose Vimeo page does it go on? Who gets to blog the video/photos? What if you shot it and a contractor edits it? What if a contractor shot it and you edited it? What if a contractor shot AND edited it? This is particularly a big deal in the wedding and event market where you have a lot of fellow wedding vendors shooting and editing for one another as people try to relieve their backlog. Imagine if a bride comes across the exact same video on someone else’s blog that is on YOUR blog or site? It could get awkward. By the way, that happened to me in my first year in business. The videographers who shot my own wedding (a wedding I edited) had their edited version of my wedding on their site, and I had MY version on my site. A potential client commented as such. Very simple, it comes down to your contract. (Please tell me you’re having your contractors sign contracts. That IS why they’re called contractors.) First off, let me say that employees’ work are automatically credited to the company studio. Employees by definition are work-for-hire and as such, all work they do is for and owned by their employer (although, it’s still smart to have an employee contract that makes it perfectly clear). When it comes to contractors, the most important thing is communication and comprehension. Communicating up front what is expected and who will own a work, then making sure they contractors understand that. By law, unless you have a contract that stipulates otherwise, the person who creates an image OWNS the image. That means if you hire a second shooter with no contract, they have a legal case to claim ownership of any work they did for you. So please, make sure you have a contract. Is the contractor in your market? Does the contractor typically market to the same clients? Is the contractor doing just a small aspect of the job? If I hire a motion graphic designer to create an opening graphic for a commercial job I’m doing, I’m not too concerned about that designer including that graphic in a reel of motion graphics (especially if that’s what they are primarily marketing).That is one small aspect of the job. Even if a commercial client of mine came across the same graphic in a reel of graphics, it wouldn’t come across as awkward. My client wants to know that my company is handling the job, so having some percentage of it created by a third-party is no biggie. Now, if I hired a graphic designer to create a full 2-3 minute After Effects animation for me, that is something I would not necessarily want on the contractor’s reel. I would only care about this if it was my plan to do more similar jobs. In that case, I want MY company to be associated with producing that kind of work. Therefore, any pieces I have created that fit that condition, I want only represented on my portfolio. This is really no different from if that contractor were an employee making motion graphics for me. Now, before all the motion graphic designers get all in a tizzy, remember what I said at the outset. It’s about communication. Anyone I would hire to produce such a piece for me would know up front that is my intention. They can then charge me accordingly for the right NOT to post said item on their portfolio. When it comes to traditional video editing or shooting, similar decisions have to be made. The scope of the project may also determine how it’s handled. Particularly large commercial jobs will have credits in the video description, giving props to all the companies or artists involved in the key “above the line” duties like director, producer, editor, etc. (This promo for the feature film “Killing Lincoln” is a great example). But most of the jobs I do are smaller 2-3 minute videos in the $5,000 to $10,000 range. For jobs like that, regardless of whether I shoot or edit it personally, I will NOT put credits in the video description. They are jobs produced by my company. As long as they meet the creative and production standards the client expects, it should not matter to them who specifically worked on it. Again, this is just how I do it. For this reason, in my contracts with contractors, I do not give them the right to post work they’ve done for me on their portfolio or blog without my permission. And I state as such in my contracts. Now, there’s nothing to prevent them from pointing to a video on my site or Vimeo page and saying “I shot that” or “I edited that.” Or for that matter, blog about it and embed it. All I ask is that they are clear in the post the role they played. In some cases I have listed specific credits are particularly large jobs, or jobs where I did not pay contractors their full rate. In cases where I list credits, I put the contractors personal name, not their production company. (Unless it was a job where I didn’t pay them and their link and credit is part of the “compensation.”). For the Creative Mornings doc I shot, I gave a full list of credits in the Vimeo description. About four years ago when I re-named and re-branded my company (from Cinematic Studios to Dare Dreamer Media), I made a point to market my business as a boutique “agency.” Now, whether or not I fit the precise definition of “agency” is not important to me. What IS important was that I decided NOT to market myself as a video production company because in the eyes of the clients I went after, the most important skill set is idea generation and project management. After losing jobs to contractors I had previously hired when past clients wanted a less expensive shooter, I knew that it would be important that clients who hired me know that what they’re getting with me are the ideas the I develop. I did not want to be seen as just a camera operator (although, I have taken jobs as just a camera operator from time to time. I’m not going to turn down a gig just because that’s all they want/need me for). Ultimately, it’s about striking a balance between being fair (to you and the contractors) and not confusing your prospects. If you have a large studio where your contractors shoot and edit and you pretty much just run the business, it’s perfectly okay for you to list those projects solely on your site if you deem that’s what’s important for your business. Your studio is the one who owns the client relationship. Your studio bears the risk. If anything goes wrong on that shoot, you are responsible (and you SHOULD take responsibility, even if it’s the contractor who messes up. You can’t have your cake and eat it too.) You pay the insurance, you paid for the marketing, you built the brand, and you paid the contractor for his/her time. As long as everyone is clear about that up front, there should be no issue. But you don’t have to be a jerk about it. Be open to allowing contractors to post videos on their Vimeo or YouTube channels, or at least blog about their role in a video. Take it on a case by case basis. Doesn’t mean you have to do it every time. Just be open to it. Filmmaking is a collaborative process. Most sophisticated clients know this. It often “takes a village” to make a video. It’s okay to give credit to the villagers involved, just make sure in doing so you’re not hurting your business in the process. Ultimately, in most cases of small studios and/or production companies, you hire contractors to do work on behalf of your company. The result of that work should go to the progress of your company. This is a great post. As the tools become available to more people starting out, we are all discovering that indeed it does take a “village to make a video”.. often people are working for little or no money and “exposure” and “credits” become of massive importance. Enjoyed reading this, thanks for sharing.